Love it John! Where was this?? Thanks Carla. Quite a bit south of the guard station near Valley of Fire. What a great happenstance. Did you get to go inside? Love the simplicity of this image. Yes, we did. Chuck has a new image on his newsletter out today from the same location. Its a great image! Cool find. I like the double mystery: the abandoned wheel chair and what lies behind the black door at the end of the hall. Also like the ever-so-slight dutch tilt to the comp (or are the walls just crooked??? ); adds a bit of vertigo to the scene. Nice one. Thanks Frank. I’m sure the slight tilt was my pointing the camera down just a little bit…. Nicely done, John. Your height was certainly an advantage in getting the chair fully into the shadow. I would have loved to stay and explore that place further, but I thought I heard some slamming around and a voice, so I took my leave. Monsters live in places like that. I guess my door slamming and loud grunts worked. Now I have a photograph of a life time an award winner, a masterpiece… a…. oh never mind… I have another picture… what the heck was I thinking? What I love about the photo is how ‘intact’ this abandoned place still appears. Many of these types of places are falling apart, covered with graffiti etc. But this looks perfectly intact. I mean it still looks like it has clean carpeting, at least in the photo! And with the light falling on the wheelchair it looks like the person who usually rides in it just left and is going to come right back into the frame if we just wait a few minutes. I love the comment about the door slamming and grunts. I think I could really see you doing that had you thought of it at the time! Now that would have been funny!! Finally a reason I would have found to turn on the video mode of the camera. To see Chuck running out…..
A powerful image in so many ways! Can see this as a horizontal as well. 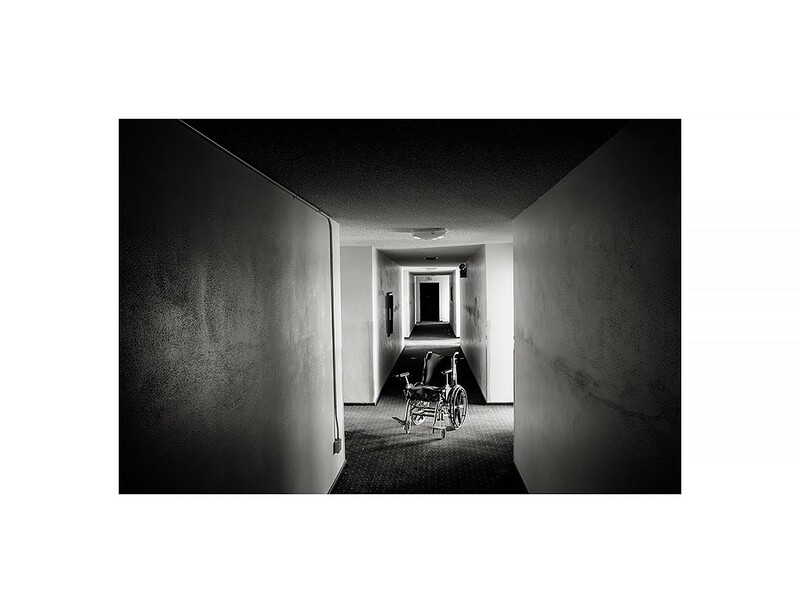 Having had a father in a care facility home with a hallway similar to this… “Left Behind” and the projected perspective of the hallway, doors with guests inside… all bring back memories of my visits there and his check in but not checking out… Indeed this image has depth beyond the simplicity aspects… Definition, experience and the adventure! Great post, story developing the scene and powerful capture! Congrats on this episode of The Barclay Zone!